Navajivan Trust, B/h Gujarat Vidyapith, Ashram Road, Ahmedabad, India 380014. Rohith Vemula took his life three years ago on January 17th. 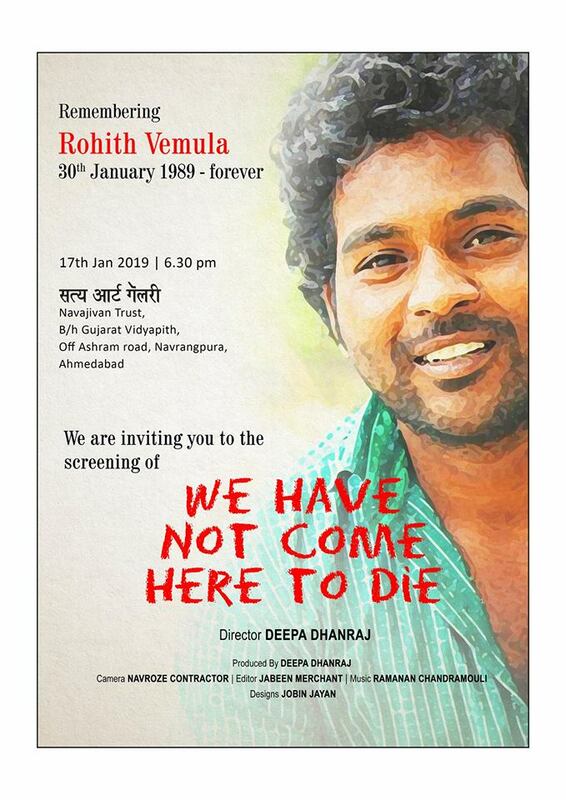 ‘We have not come here to die’ is a film directed by Deepa Dhanraj remembering Rohith. On the day of his 3rd death anniversary, the film will be screened at multiple venues across the country. On January 17th, 2016 a Dalit, Ph.D. research scholar, and activist Rohith Vemula unable to bear the persecution from a partisan University administration and dominant caste Hindu supremacists hung himself in one of the most prestigious universities in India. His suicide note, which argued against the “value of a man being reduced to his immediate identity” galvanized student politics in India. Over the last year, thousands of students all over the country have broken the silence around their experiences of caste discrimination in Universities and have started a powerful anti-caste movement. The film attempts to track this historic movement that is changing the conversation on caste in India.